Please refer to our stock # G0175 when inquiring. 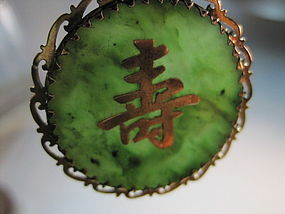 A beautiful mid-century Chinese spinach green Jade pendant with Chinese character "Longevity". Mounted on silver and in excellent condition. D:1-1/2"